California Legislature Approves Assisted Suicide Bill : The Two-Way The bill that would allow physicians to prescribe life-ending medication to patients now rests in the hands of Gov. Jerry Brown. 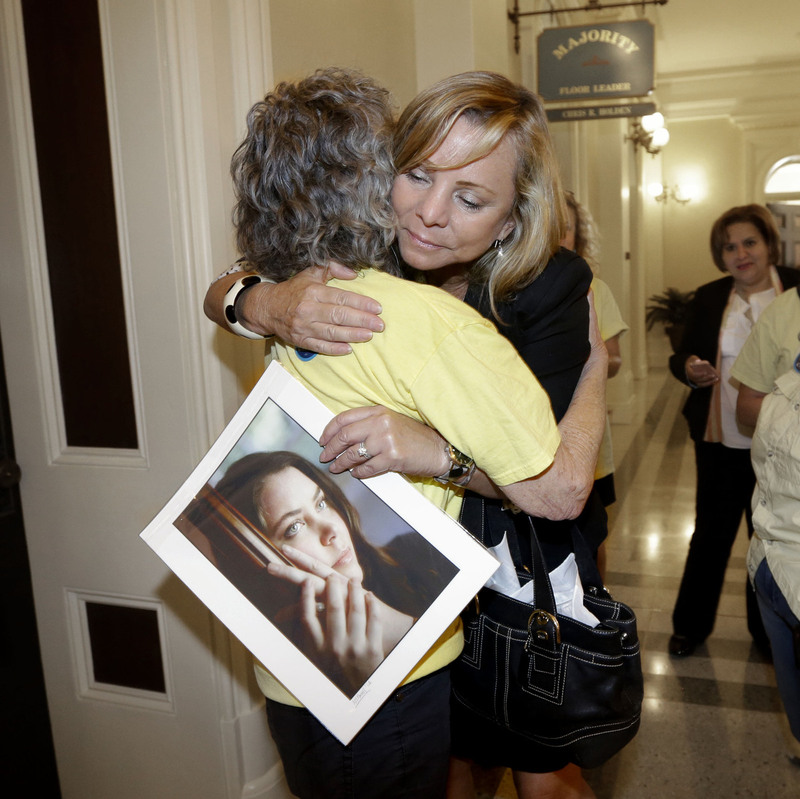 Debbie Ziegler holds a photo of her daughter, Brittany Maynard, as she receives congratulations from Ellen Pontac, after a right-to die measure was approved by the state Assembly, Wednesday, Sept. 9, 2015, in Sacramento, Calif. The End of Life Option Act was passed by the State Assembly on Wednesday; Friday's final approval by the Senate sends the bill to Gov. Jerry Brown. Brown, a former Jesuit seminarian, has not indicated whether he will sign the bill, April Dembosky with member station KQED in San Francisco tells All Things Considered. "We do know if he does nothing, in 30 days the bill will become law," she says. "The idea is really for patients who are very near death, maybe weeks away, whose suffering has become unbearable or intolerable, they could ask their doctor for drugs that could end their lives," Dembosky says, adding that there are many guidelines to meet before a patient can obtain the medicine. "First of all, patients have to be physically able to swallow the drugs themselves, and also they have to be mentally capable of making medical decisions. This not something for Alzheimer's patients or people who suffer from severe depression." But there is significant opposition to the bill. Most of it, Dembosky says, comes from religious groups who say only God can decide when a person's life is going to end. Disability rights groups also oppose the bill because they are worried about the potential for abuse of the law. Dembosky says the groups argue that a person who is concerned about being a financial burden on their family could "either choose or be pressured into taking these life-ending drugs instead of pursuing more expensive life-sustaining treatments." "For example, the bill makes it a felony for a health insurance company ... to deny treatment or coverage based on whether a patient seeks these drugs or not," she says. "Patients also have to ask for the drugs three times before they can get them, once in writing in front of two witnesses." "Because the rest of my body is young and healthy, I am likely to physically hang on for a long time even though cancer is eating my mind. I probably would have suffered in hospice care for weeks or even months. And my family would have had to watch that. "I did not want this nightmare scenario for my family, so I started researching death with dignity. It is an end-of-life option for mentally competent, terminally ill patients with a prognosis of six months or less to live. It would enable me to use the medical practice of aid in dying: I could request and receive a prescription from a physician for medication that I could self-ingest to end my dying process if it becomes unbearable. "I quickly decided that death with dignity was the best option for me and my family."